All transactions are safe and secure with a reliable history in online purchasing behind each of our associates. 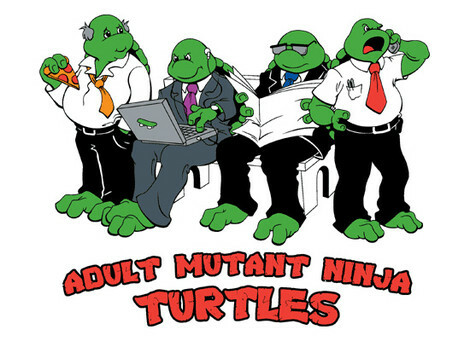 Buy the Adult Mutant Ninja Turtles t-shirt to own TMNT clothing and merchandise. This TMNT shirt features the world's most fearsome fighting team as adults. What, you thought they'd stay teenagers forever? Leonardo is equipped with a newspaper instead of two ninja swords. Donatello gave up his bo staff for a laptop. Raphael settles disputes with his cellphone instead of his two sai, and it appears Michelangelo would rather hold a slice of pizza than his nunchucks. Celebrate some of their best moments with the Teenage Mutant Ninja Turtles tees, comic books, hats and movie DVDs. In addition to the Adult Mutant Ninja Turtles tee above, browse the TMNT Clothing Gallery for more apparel like men's and women's clothes, kids shirts or hoodies.